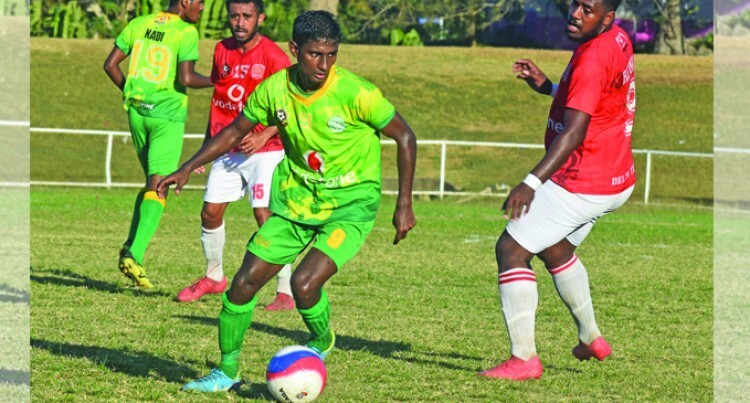 Two goals in each spell were enough for the Ver­eti Dickson captained- Jack’s Nadi side as they defeat Rewa 2-0 in the Vodafone Pre­mier League match at Prince Charles Park, Nadi yesterday. What happened: Nadi drew first blood in the 19th minute Ame Votoniu’s attempt o deflect­ed off Rewa midfielder Amani Makoe which caught goalkeeper Benito Waqavou napping. Halftime: Nadi 1- 0 Rewa. Nadi came out firing in the sec­ond half when a Rahul Krishna run saw him create space for Christopher Kumar to blast in the second goal. The Dreketi football side put on a gutsy performance despite losing 2-1 to Ba during the Voda­fone Premier League clash at Govind Park, Ba yesterday. What happened: The visitors started on a high note as they applied pressure on the Ba de­fence. The Ba defenders held their ground and opted to lodge their counter attacks. The move paid dividend in the 29th minute when striker Abbu Zahid broke away and slotted in the first goal. Ba got a shock when Dreketi equalised in the 53rd minute. A Daniel Dass strike saw the ball zig-zagged its way into the back of the net. The visitors soon were a man down when striker Anish Khem got a red card. The Suva football team found their winning form after they beat Tavua 2-0 during the Voda­fone Premier League clash at Garvey Park, Tavua yesterday. What happened: Both teams were scoreless in the first half. After a pep talk from coach, Gurjit Singh, the Suva football side came back firing at the start of the second half. Suva never looked back as Bruce Hughes slammed in their second goal to seal the win. Tavua coach Nazeel Ali said: “It was not that we tried our best but Suva was good as well. “We need to stay in the Premier League and we need points so we will need a win.